Shopping for Batman Film Cells? Epic film cell bookmark from Batman: The Dark Knight Rises! Own a piece of Christopher Nolan's masterpiece final Batman film. Special edition bookmark with a film cell on it! This excellent film cell book mark features an actual piece of film from Christopher Nolan's masterpiece film Batman: The Dark Knight Rises, the final in his series of Batman films. A special edition, this Batman Dark Knight Rises Series 2 Film Cell Bookmark looks absolutely stunning. 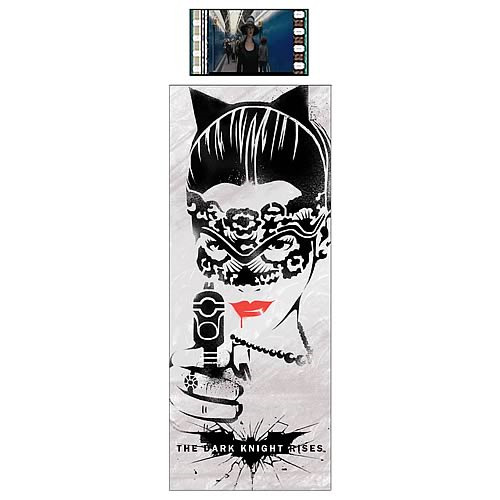 The bookmark measures 6-inches tall x 2-inches wide and features a Batman: The Dark Knight Rises cell above a stencil-style image of Catwoman pointing a gun.